CNG: Printed Auction CNG 75. INDO-PARTHIANS, Gondopharid Dynasty. Sarpedones. Circa 15-1 BC. BI Drachm (1.56 g, 9h). Sale: CNG 75, Lot: 671. Estimate $1000. 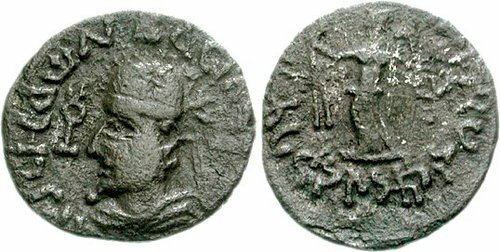 INDO-PARTHIANS, Gondopharid Dynasty. Sarpedones. Circa 15-1 BC. BI Drachm (1.56 g, 9h). Diademed and draped bust left; tamgha before / Nike standing left, holding wreath and palm; monogram to right. Senior 252.3D. VF, brown patina, light roughness. Extremely rare, only the second specimen known and the only one not in a public collection.